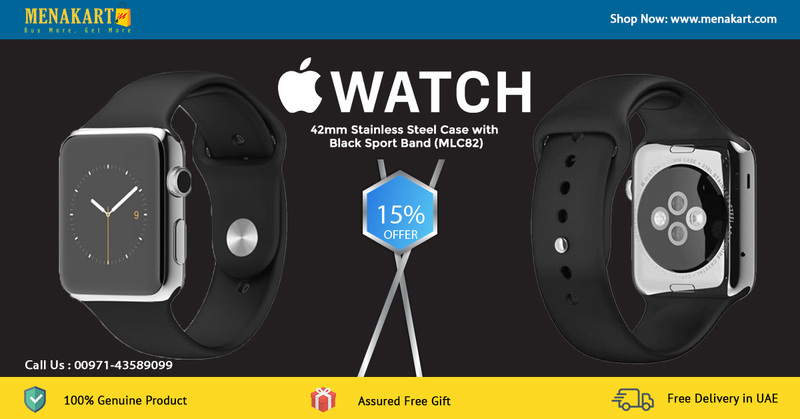 The Apple Watch with a 42mm Stainless Steel Case is a functional tool that can help improve the quality of your life while you are on the move. This smartwatch has the Watch OS developed by Apple, which serves to equip it for novel purposes. A Retina display vividly casts images that look like they have been painted on the touch screen. This smartwatch can be used by tapping the touchscreen with Force Touch functionality or by rotating the crown. Look at the time differently with customizable wrist watch complications and different dial faces. Integrated with the iPhone and Siri, this watch can accept commands spoken to it when raised to be near the mouth. It connects to an iPhone by means of WiFi or Bluetooth. The Apple Watch gives you an accurate reading of the time. It is an ideal fit into your busy daily life and helps you stay on schedule, in constant connection and moving in the right direction. That’s not all; it also helps you pay more heed to your health and fitness and never stops thinking of ways to keep you more active. This is much more than a watch and everything a watch should be. Make the best out of your day with the Apple Watch that not just tells you the time but helps you manage it successfully. It is tailor cut to fit your lifestyle and apart from giving you the accurate time also enables you to work with time in ways that suit you best. So if you have to be with someone on an important occasion, make sure you are there on time. The Apple Watch gives you over two million different ways to see time. It is available in a variety of watch faces that you can change when you feel like it. Add specialized functions to most faces whenever you like. These additions are known as complications in watchmaking. You can choose stopwatches, stock quotes, weather updates and lots more. Mix and match your unique style. Combining options lets you expand the possibilities for personalization. The Apple Watch lets you connect more intimately. Don’t just see and respond to messages, calls and notifications, feel them. This is not so much about reading words on a screen as it is about making a genuine connection. This amazing watch gives you instant and easy access to the people you are closest to. All you have to do is press the button next to the Digital Crown, and you have ready access to Friends. Friends is a place that holds thumbnails of those you stay in touch with the most. Just tap a thumbnail, and you’ll be able to stay in touch with everyone who matter to you via calls, messages, or some new ways that this watch makes possible. The Apple Watch alerts you of messages, calls and mail that you receive with customized taps. The audio cues are just as subtle, and different sorts of notifications have their unique ways of alerting you. Find out who’s trying to reach you with just a glance. The watch is a brilliant combination of an all day fitness tracker and an advanced sports watch. It measures your movement with far more precision as it tracks a wider variety of activities with its ability to collect more types of data. It measures your total body movement using an accelerometer. A custom sensor measures the intensity of your physical activity by tracking your heart rate while the GPS and WiFi in your iPhone help track the distance you’ve covered. The Watch features something called the Activity App that delivers a simple and impacting graphic of your daily activity. It is simple to understand as it is comprised of three rings that present everything you need to know. These three rings include the Move ring, the Exercise ring and the Stand ring. The Move ring depicts the amount of calories you’ve burned, the Exercise ring illustrates the number of minutes of brisk activity, while the Stand ring shows you how often you’ve stood up from a seated position. What’s the point of these rings you may ask? They help you on your path to a more healthy and active lifestyle. Move around more, refrain from staying stationary too long and get in some exercise. The Apple Watch also features a Workout App that gives you a more detailed measurement. It’s helpful during, say, a cardio workout and gives you valuable realtime stats in regards to time, distance, calories, and pace. Set a goal for yourself before you start out on your regular workout routine. This watch eggs you on with some much required encouragement for you to meet and surpass your goals. It gives you a thorough account of what your achievements are, so you will constantly strive to do better. You can now keep track of your progress over the day, a week and even a month. This is possible thanks to the Fitness app that accompanies your Apple Watch on your iPhone. Monitor your activity history over long periods of time with this app and see how far you’ve come. The watch also comes with a Health app on iPhone that enables you to share your activity and workout data with other fitness apps. The Apple Watch is a new way to enjoy all of your favorite apps. It’s not just a new location for the apps but a completely revamped experience too. With Glances, a new time saving feature, relevant information from each app is condensed, thus enabling you to scan easily on the fly. Be alerted of notifications instantly with this little watch that taps you every time you get one.